4/20 deals are beginning, scroll down to see the first deals! PROTANICALS™ is the only physician-formulated product line on the Oregon Cannabis market! And they will be in-house from 12-3pm on Saturday April 13th! Ask them any questions you may have about tinctures, cannabinoids, or natural herbs! All of their herbs are sourced from ecologically conscious growers from around the world who are using regenerative methods. This strain most commonly starts as a euphoric, cerebral and uplifting high that boosts creativity and energizes the mind. Generally followed by deep body relaxation & sedation. We might recommend this strain for people who have issues with insomnia, minor pains, depression and anxiety. Tastes of pepper and herbs, with a tropical aroma. Full Sativa that is a cross of Papaya & Purple Extra Terrestrial Vehicle. This strain has been known to be uplifting and creative. Good choice for a day out on the town, and enjoying this Spring season! With smell of sweet lemons and tropical fruit. We might also recommend this strain for people looking for some minor pain relief with their energy boost. Organic Granola Bars from Edibology, packed with 50mg THC for only $10 (normally $12). Packed full of superfoods like almonds, pecans, blueberries and coconut, Edibology takes a different approach to edibles. Enjoy our Superfood Bar after the gym or just as a snack. Created by Green Dragon Extracts- the oil in these cartridges is like a fine scotch. PLUS OUR 4/20 SALES ARE BEGINNING EARLY! Save Big on the following through 4/20! From our own farm, Endless Organics, this coconut oil packs a punch with 705mg of THC. Consumers have noted its use for muscle spasms, inflammation and tension pains. Coconut oil is naturally anti-bacterial and anti-fungal. This makes it an excellent moisturizer and cleanser. Apply to skin and watch this Coconut Oil combo do its magic! 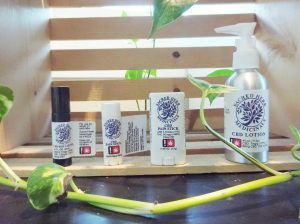 CBD derived from a Lichen that grows on invasive pine trees in the Pacific North West! Infused in Coconut Oil and that’s it. Simple and pure, and travel safe! Our Second Round of Clone orders is underway! Order before April 28th to get your plant in mid-May! It’s Spring! And the Pollen Count is incredibly high! Already have the Sniffly Nose, Sneezing allergies that Spring brings with it? This Allergy Blend tea features Nettles, a classic herb for fighting off those seasonal allergies and get you out enjoying those new sunny days! Also featuring Turmeric to relieve inflammation that causes and is caused by Allergies!